TODAY marks 49 years since the deadly Severe Cyclone Ada tore through the region, claiming 14 lives in her destruction. The cyclone was first detected in the Coral Sea on January five and slowly developed, before it intensified beyond anyone's predictions early on Saturday, January 17 flattening the town and surrounding islands. 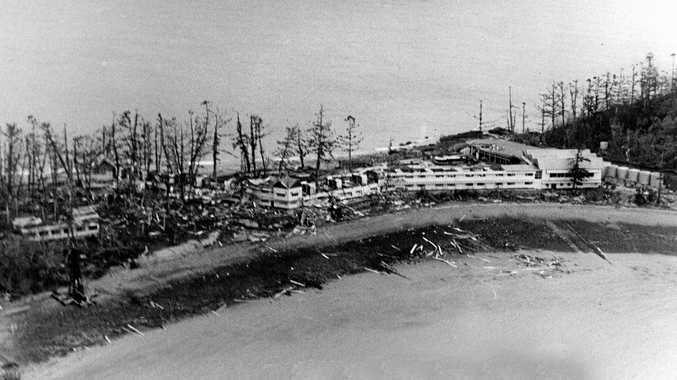 The damage bill in 1970 was estimated at $12 million, and Hayman, Daydream, Long, South Molle and Hook Islands, and the area from Airlie Beach to Cannonvale, Proserpine, Calen and Shute Harbour received the worst of the cyclone's fury. Over the years, the town has rebuilt, survivors have relayed their stories countless times, a book has been written and there have been reunions, but there is no monument to remember those who perished. The lack of a memorial to remember the 14 victims has been a talking point for some, but Gloria Demartini has been passionate in her pursuit and is heading a campaign to get a memorial erected in the community in time for the 50th anniversary. Mrs Demartini said it had taken her a long time to find the right space, and that she was working with a small committee and the Whitsunday Regional Council. "They've (the council) been wonderful and we're very privileged to get that support," she said. Whitsunday MP Jason Costigan has been vocal in his support for a memorial, to remember those who lost their lives. "I began campaigning for this memorial a few years ago, similar to what we have down in Mackay, remembering the victims of the great 1918 cyclone, what they have up in Darwin after Cyclone Tracy and in other places," he said. "Sadly, the Whitsunday Regional Council has been slow on getting it happening but it's heartening to hear via the media that we now have something happening in the lead up to the 50th anniversary in 2020. "Like other locals, I personally know some of the families of the victims of Cyclone Ada and one man in particular who's been known to my family for almost a century. Tragically, he lost his wife all those years ago whilst holidaying on South Molle Island and his son grew up, never knowing his late mother. The very least we can do is to get that memorial erected once and for all, remembering those individuals who died in this terrible tragedy whilst also acknowledging the massive recovery effort." Kaye Cronan was working aboard the Daydream Cruise boat in Shute Harbour the day the cyclone blew up. "We brought the tour in at lunch time, and refunded some money to the tourists," she said. "We were expecting rough water, and then it came, and it just blew us to pieces." Mrs Cronan said the 112 foot boat sunk in front of the jetty, and that herself and her husband and a few crew members were washed away. "We didn't know where we were because the weather was so bad," she said. "We were swimming in the water along with our deckhand who still lives in Airlie Beach. We had a barman on the boat, but he couldn't swim, and his body washed along with us. My husband tried to save him, but to no avail. Eventually a boat came, and we were taken to hospital." The region was so flooded, that Mrs Cronan was taken by boat, all the way to the railway tracks on Hamilton Plains, where an ambulance met her to then transport her to hospital. Mrs Cronan spent three months in hospital after the ordeal, and three people had to be bought in from town to give her a direct blood transfusion. The entire community had to be vaccinated against typhoid as a result of the tragedy. Mrs Cronan believes a memorial is only right for those who lost their lives. "Some of those people didn't get a proper funeral because of the chaos that was happening, times were extremely tough." According to an Australian Geographic article, Cyclone Ada is ranked as the fourth worst in Australian history, after it claimed 14 lives on January 17, 1970.